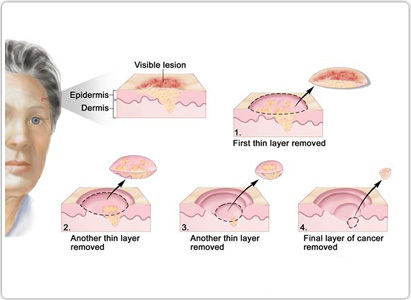 Skin cancer is a malignant tumor develops in skin, especially the exposed skin. It disturbs people mentally and physically. Skin cancer examinations can be divided to self examinations and pathological examinations. Early detection of skin cancer would be great helpful to treatments. Since most people get a mind that having examinations in hospital is inconvenient, below is the introduction of self examination of skin cancer. 1.Be naked when you face mirror (it is same below), start from your both arms to check your palm center, figures, fingerwebs, forearm and postbrachium. Lift up your hands and bend your elbow joints to check the skin of inner side of forearms and joints. 2. Check the front of body, like face, neck, chest, abdomen, mons pubis and lower limbs. 3. Check the bilateral sides of body with hands lifting up, then start checking from left side to right side. 4. Keep your back to the mirror and hold another small mirror to check the nape of neck, back, hips and local skin of two arms. If it is hard to check by only one person, you may ask your mate or good friend for help. 5. Ask someone to move aside your hair with comb to check if skin of head has somewhere suspected. If you are male, you can check in by yourself when your hair is short. 6. Sit down to check the instep, heels, toes and soles of feet. Then take a mirror behind your legs and keep moving to see if any signs of lesion. Specialist from Modern Cancer Hospital Guangzhou said, if any abnormality occurs in skin, please come to regular hospital for overall examination in time. Firstly, avoid get in touch with radioactive substance. Especially the patients have chronic skin disease or the people who have to contact some radioactive substances, coal tar and bitumen, once papule or nodules occur in skin, should be alert to the occurrence of skin cancer. And this is an important proof of skin cancer. Second, any abnormal signs of skin should be noted. Specialist in Modern Cancer Hospital Guangzhou figured out that if hard nodules, which are with swelling edge and tends to spread around, develop in skin that possibly may be skin cancer. For the people older than 40 years old have to pay higher attention. Last, the most important base to diagnose skin cancer is examination of histopathology.